Batley Bulldogs will aim to hit the ground running when they welcome Barrow Raiders to Fox’s Biscuits Stadium for the opening Betfred Championship game of the season on Sunday. Batley enjoyed a decent pre-season and were narrowly edged out by Bradford Bulls in the Yorkshire Cup final a fortnight ago. While three meaningful pre-season games against Hunslet, York and Bradford will have made Batley battle hardened for the new campaign, coach Matt Diskin knows his side will need to be fully focussed when Barrow arrive. 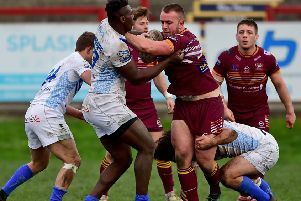 Batley were the form side at the end of last season, winning their last six games in the Championship Shield and Diskin has further strengthened his squad for his third season in charge at Mount Pleasant. Diskin admits he has a good idea of his squad for Sunday’s opener but is well aware players are waiting in the wings to be given a shot. Diskin said: “Picking 17 (players) will be easier because having to manage seven subs is hard, trying to get everyone equal game time as well as competing to win a trophy. Batley have shown an interest in Hull FC’s highly rated Ireland international prop Lewis Bienek but rumours that the signing has been completed are wide of the mark and he will not feature against Barrow. The 20-year-old could join Batley but has not yet been to the club or trained with the squad. The Bulldogs handed powerful back row man Paul Brearley a one year contract following a successful trial period with the club having joined from amateur side Rochdale Mayfield.